Will Smith isn’t a name that comes up frequently (or ever) in health technology circles. But if Los Angeles startup BioBeats has its way, players in Hollywood and healthcare are going to find themselves on increasingly common ground. In the past year, the company has launched a couple of what it calls “experiments” that use biometric data to shape a media experience. 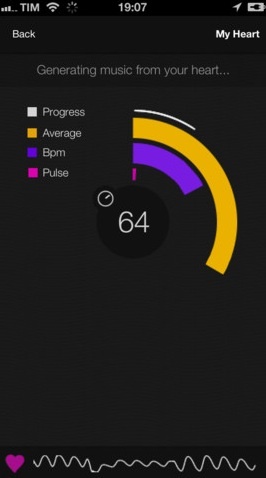 For example, its smartphone app Pulse generates music based on the drumming of your heartbeat. And it’s organized events where the DJ plays music based on the average tempo of the dancers’ heartbeats. On Thursday, BioBeats will announce that it has raised a $650,000 seed round from an interesting mix of investors to help it move even deeper into what founder Nadeem Kassam describes as “adaptive media technology.” Its backers include actor Will Smith, Justin Bieber’s manager Scooter Braun, comedian Damon Wayans and other entertainment executives, as well as ENIAC Ventures, Zhen Fund, early Facebook executive Kevin Colleran and angel investor Gotham Chopra. With the new funding, Kassam, who previously founded the company behind the Basis fitness tracking watch, said the company plans to develop a set of consumer tools, as well as research applications that could be used in clinical settings. With its first tools, the company has just scratched the surface of that vision. The Pulse app uses the iPhone’s camera to discern the user’s heart rate and then it layers music on top that matches its beat. Another experimental app developed at a hackathon, tapped into Spotify’s API and enabled users to generate playlists based on their emotions. It’s also worked with the hip-hop group Far East Movement on a concert that measured 1.5 million heartbeats during a performance. But Nadeem’s ultimate goal is to build technology that monitors a person’s emotional state through all kinds of sensors and then delivers the most appropriate content. For consumers, he said, that could mean a horror movie that adapts to your level of fear or music that changes to match your mood. And in clinical settings, it could be used to determine a patient’s stress level and then offer up calming sounds or provide the right kinds of motivational messages to help a patient stick to a prescribed regimen. In addition to raising the funding, Kassam said the company has also brought on board a Chief Medical Officer, Dr. Kristin Shine, to lead its team of “biohackers” and the company’s work in clinical research. BioBeats recently won a U.K. competition organized by the country’s Innovation Agency and the British Medical Journal and will begin testing its first clinical application this month. It didn’t go into details, but said it would focus on stress and anxiety and later expand into cystic fibrosis, asthma, hypertension and other areas. While BioBeats is uniquely positioning itself at the intersection of healthcare and entertainment, it’s part of a larger wave of companies trying to build emotionally aware technology. For example, startup Beyond Verbal offers voice recognition software that claims to decode a person’s emotional profile with 10 seconds of recorded speech. And, in the academic world, researchers at North Carolina State University are developing computer science learning software that analyzes students’ facial expressions to deliver feedback that’s most relevant to their emotional state. Image by JeremyCulpDesign via Shutterstock. I am regularly use your blog. Every time you gives me very useful information.This is a problem many healthcare companies will have to face in the near future. Very interesting idea. This is a problem many healthcare companies will have to face in the near future. Hey Emilio. We agree, although our focus is on wellness solutions, we hope to influence and help healthcare companies achieve better compliance rates and therefore better outcomes, and in particular, we’re interested in doing that for levels of population where social healthcare systems can’t (or will not) reach.